Well, I've started a quick game to take a look to 1.17a patch... And in one of the first battles I found an odd thing. Here I show the battle report. As indicated, a message tells me that General D. Miles is amongst the casualties of battle of Winchester, VA. The odd thing is that the cross which indicates the death of this general doesn't appear next to his star of brigadier general. Is this normal and am I missing something? PS: At first, I thought he could be wounded and that he could be in any nearby city, but I looked at the ledger and he wasn't among the USA generals. Ethan wrote: Well, I've started a quick game to take a look to 1.17a patch... And in one of the first battles I found an odd thing. It is possible that he did not die during the battle. If you look at your picture, on line 35 it says you reteated taking 1 hit. I am going to guess, but I believe the 1 hit was Miles. 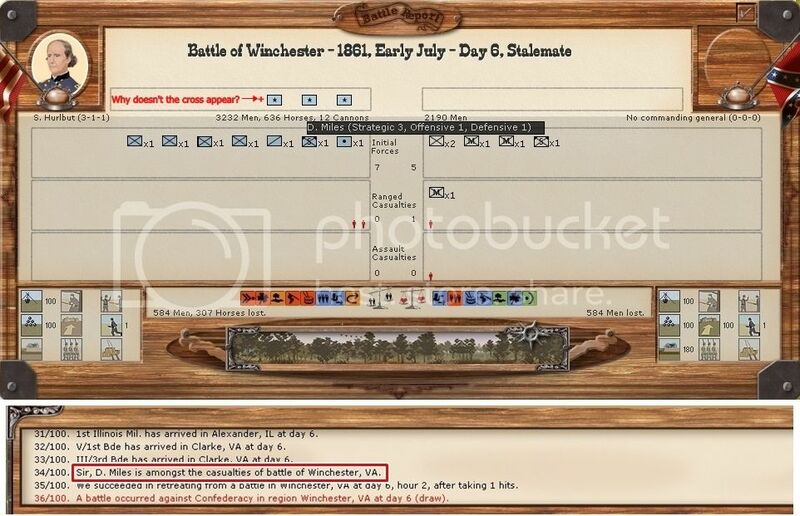 This would explain why he doesn't show in the battle report (units destroyed in the retreat are not displayed in the report, only in the box below, with 1 line per unit). OK, Jim, thank you for your reply. It's possible that happened that. The truth is that I hadn't thought in that way.